BEERAMANGALA. 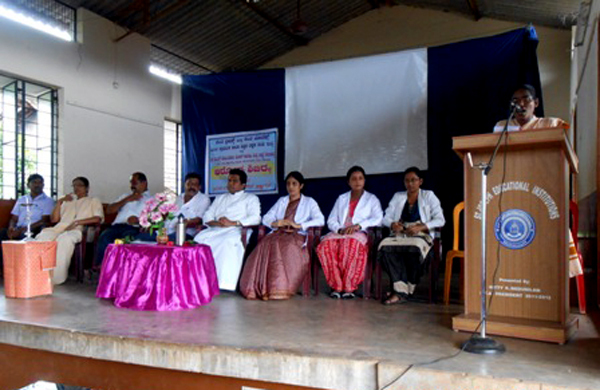 JUL.5: A Homoeopathic Medical Camp was organized at Beeramangala, Sullia by St Brigid Church and Chaitanya Homoeo Care. The team leader Dr. Deepa Pais spoke on upbringing of the children and the problems faced during the same with some light on nutrition. Dr. Shwetha and Dr. Shasikala, the PG students of FMHMC spoke on the common health problems of the children. A total of 450 people benefitted from the talk. This was followed by medical checkup and treatment. A total of 146 patients were given medicines.